Eastern Orange Tip, Aurore de Sicile, Зорька дамона. The species is distributed in southern Europe and Asia Minor. Armenia is inhabited by subspecies A. d. eunomia Freyer, 1851. The species is distributed mainly in Central Armenia, although an isolated population at the vicinity of Lake Sevan was also found. Eastern Orange Tip primarily inhabits mountain steppes, but also occurs in juniper woodlands, occupying elevation range from 1200 to 2200 m a.s.l. The host plant of the species in Armenia is Isatis latisiliqua. Butterflies are on wing from late April to early June, depending on elevation, giving one generation per year. The species is slightly uncommon within typical habitat. Its population trend during 2003-2013 demonstrates moderate decline, which is most probably related to overgrazing. The host plant is a soil sensitive and quite specialized Crucial. It appears that although it is not being grazed in a wide scale, general soil degradation caused by intensive grazing influences the host-plant's population. In lower and therefore drier areas on Eastern Orange Tip's distribution, the early mowing can cause removal of the host plants coinciding with the last stage of larval growth. There is a medium scale trade of Eastern Orange Tip, which in Armenia is mainly based on breeding of the butterflies. The species has not been evaluated for Global and National Red Lists, while at the European level it obtained a status of Least Concern. Also it is not included in the Appendices of CITES and Bern Conventions. Preliminary evaluation of its conservation status suggests it as Near Threatened. 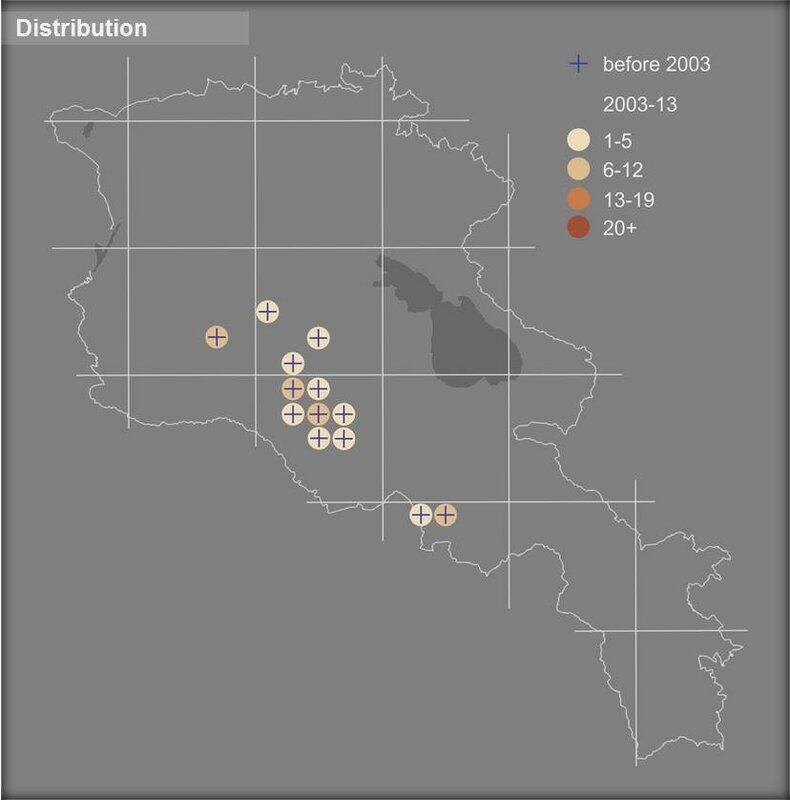 Distribution range of the species is covered by Gnishik Protected Landscape, Khosrov Forest State Reserve, Lake Sevan National Park, and also by Gnishik, Khosrov Forest, lake Sevan, and Arai Ler Emerald Sites. Also the species is presented in Gnisheek, Ourtsadzor, and Artanish-Shorzha Prime Butterfly Areas. For conservation of the species, it is proposed to develop alternative approaches for grazing, which can improve the productivity of farm and in the same time to support preservation of the species' host plant. Also it is suggested to review the mowing norms in the dry steppe areas, and to study feasibility of livestock husbandry based on fodder production, rather than outrun grazing.